When it comes to your business, you must ensure that every inch of it is protected. Many people ignore the outdoor perimeter of their establishment and focus on the inside. 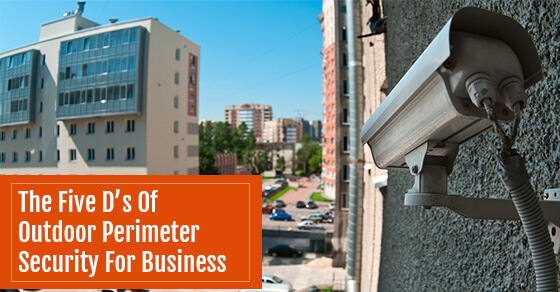 However, the outdoor security of your business is equally important. To protect your building’s entire structure, there is a key security principle that you can use: The five D’s. They are Deter, Detect, Deny, Delay and Defend. Each plays a specific role in securing your business’ exterior. Your first line of defence is deterrence. In order to keep criminals away, you have to deter them from even thinking about setting foot on your property. To create a shield of deterrence, you need to start simple with signs. Put up signs that say “No Trespassing,” “Property Under Surveillance,” “Guard Dog on Premises” and “Security Personnel On Duty 24-7.” You may not have a guard dog but the suggestion of one could be enough to keep criminals at bay. Another line of deterrence is to have surveillance technology. Having CCTV security cameras visible will discourage criminals. Protect your building’s perimeter with equipment that can detect trespassers. Surveillance cameras, motion sensors, and other security equipment that can sense movement are all must-haves to ensure that anything out of the ordinary is detected. To keep your perimeter secure while letting authorized personnel come and go, you need to deny those who aren’t supposed to be there. With a manned security gate at the main point of entry, anyone who isn’t supposed to be coming and going will be stopped immediately. Another way to deny criminals entrance to your property is with card access. This is an added security measure that ensures that even when people are in the building they need to use an access card to get into certain areas. You can even have your employees scan their cards at the manned security gate. A delay system should be in place in case something should go wrong with your security system and an intruder is able to penetrate the building’s perimeter. This can be done through interior locking doors and barriers. By having a delay system you give your security team and the police enough time to respond to the intrusion and the criminal cannot get away. To defend your perimeter against intruders you will need the help of local law enforcement and your security personnel. This involves having a protocol in place for making sure a criminal is being watched during the time period after they’ve been apprehended by your security personnel, and the time law enforcement arrives scene. Creating optimal outdoor perimeter security requires planning. However, once you have the Five D’s in place, you can rest assured that your business is safe.